Youth Librarian Mr. Jim is faced with doing a cheerful humorous program dealing with the works of Edgar Allan Poe. However, Edgar Allan Poe didn’t write any poems or stories that are cheerful and humorous. It’s Tiberious T. Tiger to the rescue. Only time travel might be involved. Will Jim be able to do a program or is his career as a storyteller, in the mortal words of the Raven, “Nevermore”? Discuss Poe’s works with Poe enthusiast David Spence. 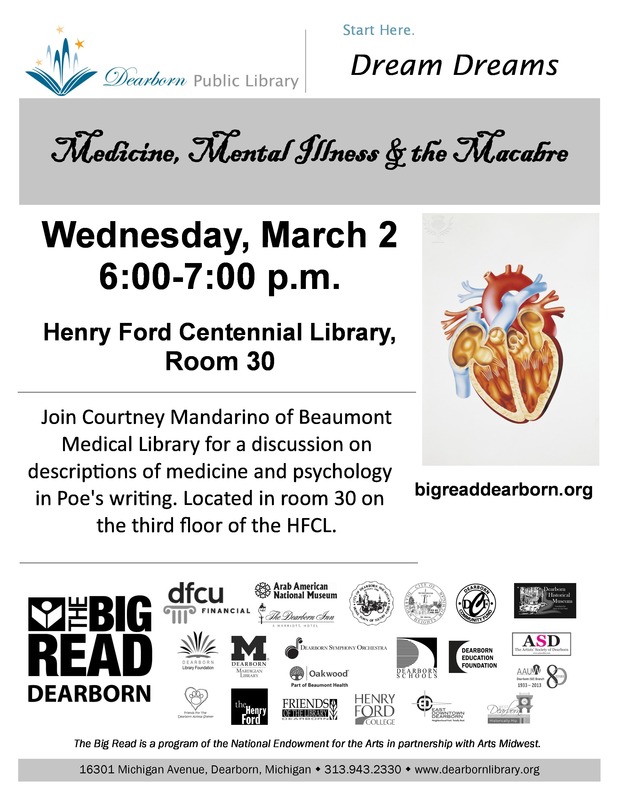 This discussion will focus on descriptions of medicine and psychology in Poe’s writing. It is widely believed that Poe suffered from mental illness himself and his own experiences may have informed the ways in which he described his characters. Drawing from such classic Poe tales as “The Fall of the House of Usher,” “The Tell-Tale Heart,” and “The Black Cat,” we will delve into the madness and medicine of the man and his stories. Here’s the flyer. 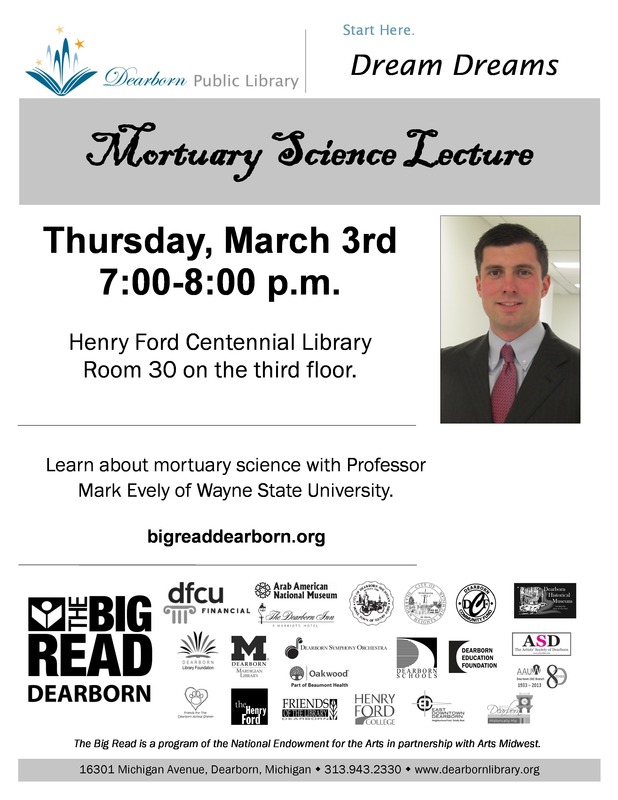 Learn about mortuary science with Professor Mark Evely of Wayne State University. Here’s the flyer. Come and taste a variety of fine wines. 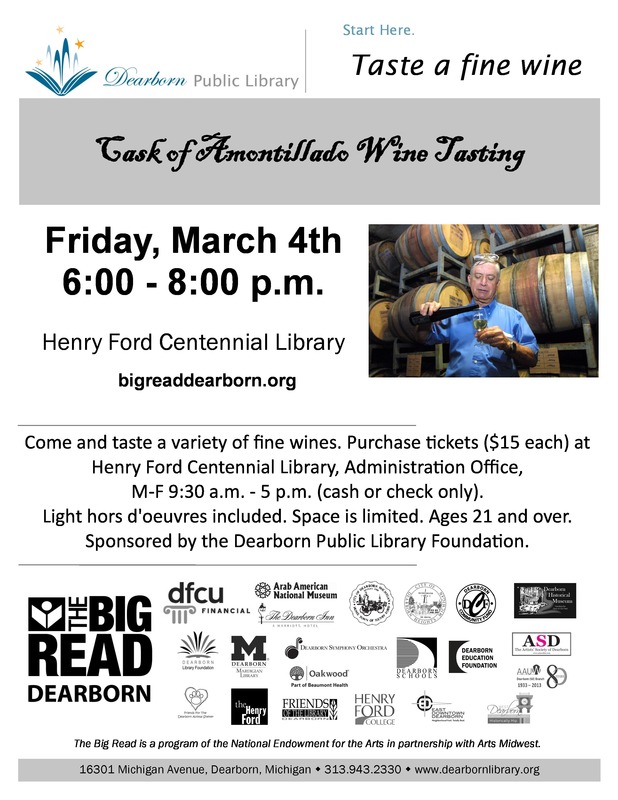 Purchase tickets ($15 each) at the Henry Ford Centennial Library administration office. Light hors d’oeuvres included. Space is limited. Ages 21 and over. Sponsored by the Dearborn Public Library Foundation. Here’s the flyer. Dreams are a fascinating way of exploring the mystery of the human experience. Is it science or art? 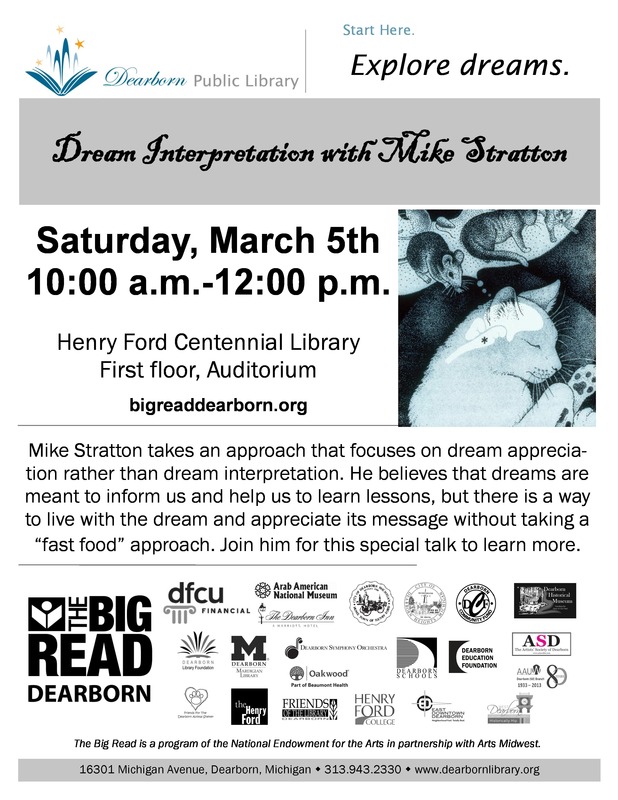 In his work with dreams, Mike Stratton takes an approach that focuses on dream appreciation rather than dream interpretation. He believes that dreams are meant to inform us and help us to learn lessons, but there is a way to live with the dream and appreciate its message without taking a “fast food” ap-proach to labeling meanings diminishing the message of the dream. Join him for this special talk to learn more about your dreams. Click here to view the flyer. 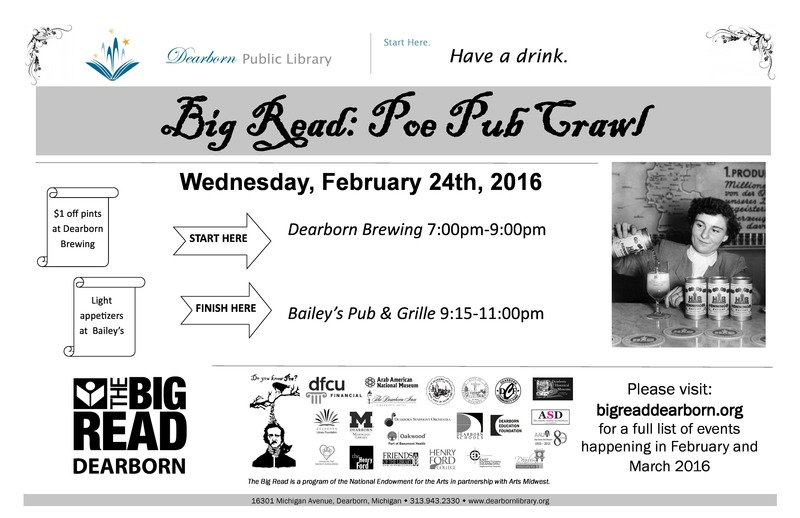 Just a reminder: the Poe Pub Crawl is tonight starting at Dearborn Brewing (7-9 p.m.) and then heading to Bailey’s (9:15-11 p.m.). Check out the flyer here. Also the Dreaming Dreams Keynote Lecture is happening in Mardigian Library at the University of Michigan-Dearborn on Thursday, February 25, 7-8 p.m. Here’s the flyer. Hope you can attend! Visit our calendar for a full list of Big Read events. A man, upon entering his fiancees’ family mansion, discovers a savage family curse and fears that his future brother-in-law has entombed his bride-to-be prematurely. Starring Vincent Price. Not rated. 79minutes. Enjoy some of our quirkier picture books and a craft in the spirit of Poe. Ages 5 – 8 years. (Younger children welcome, but please be aware that some stories may be scary.) Space is limited. Join the crawl and discuss Poe while having a Poe inspired drink along the way. Participants will receive $1 off pints at Dearborn Brewing and light appetizer’s at Bailey’s. Click here for the flyer. 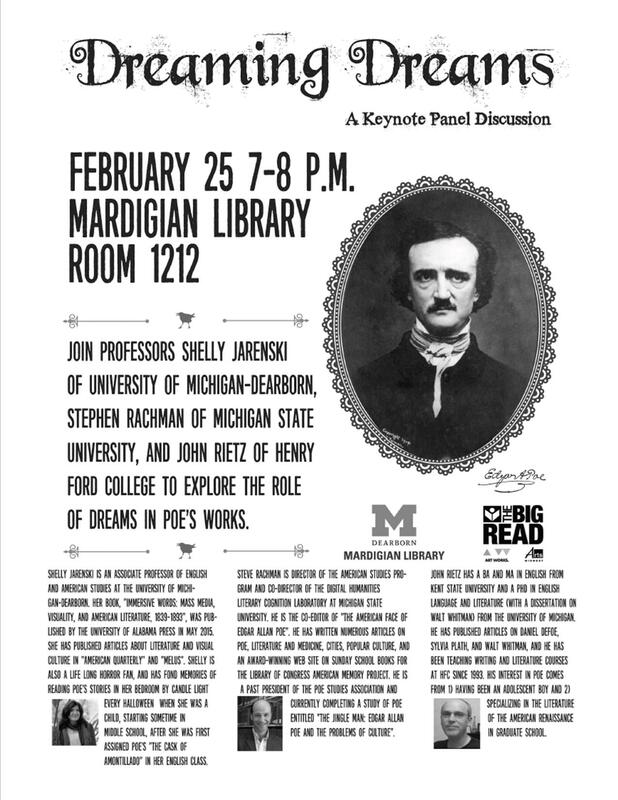 Join professors Shelly Jarenski of University of Michigan-Dearborn, Stephen Rachman of Michigan State University, and John Rietz of Henry Ford College to explore the role of dreams in Poe’s works. Click here for the flyer. In this bleak Midwinter, celebrate all things Poe. Snacks, craft, and a little storytelling are all waiting, if you dare to come. Grades 4+. No younger siblings. Space is limited. The Forensic Art program is tonight 7-8:30 p.m. in the auditorium at Henry Ford Centennial Library. Hope you can attend! Click here for the flyer. Visit our calendar for a full list of Big Read events. And here is the flyer. Detective Sarah Krebs is an experienced forensic artist who creates both drawings and 3-D recreations. She has had recent news coverage of her successes solving cases in Detroit and will discuss identifying, locating missing persons, victims, criminals, and much more. Discussion of Poe’s “Great Tales and Poems”. Make a Thaumatrope, a moving picture toy popular during the era of Edgar Allan Poe. Available while supplies last. Younger children may require assistance from caregivers. Discuss Poe’s “Great Tales and Poems” with dessert around a campfire. Pizza provided. Grades 7-12. No parents or younger siblings. Registration encourages. Registration begins Feb 4. Learn from Dearborn’s own Anne Gautreau tips on how to write like Poe. Visit Bigreaddearborn.org for more information and a full list of Big Read events or click here for a printable calendar of events. Kickoff reminder and tabloids are here! Just a reminder: the Kickoff is on Saturday, February 6, 2-4 pm at Henry Ford Centennial Library. Click here for a program guide. And we wanted to let you know: the Poe tabloids, created by students at Michael Berry Career Center, are here! Come to the Kickoff and pick up your FREE copy. Dearborn Public Library Director Maryanne Bartles and Deputy Director Julie Schaefer taking a first look at the newly printed Poe tabloids. Free tabloids, books, and light refreshments; music from Poe’s day performed by a Dearborn Symphony quartet; dramatizations of his works including a performance of “The Tell-Tale Heart” by Anthony Lucas of The Henry Ford; drawing slips to win a free night at the Poe House, courtesy of Dearborn Inn (drawing at Meet Poe event); opening of “Dreams” Art Exhibit, coordinated by the Artists’ Society of Dearborn; Poe craft for all ages; and more! Come and discuss Poe’s “Great Tales and Poems” with the Dearborn Youth Commission. Grades 6-12. Pick up a free copy of the book at any Dearborn Public Library. Join corvid researcher Dr. Star Kraven-Madd of Concorvidae University (in partnership with Naturalist Dorothy McLeer and the University of Michigan-Dearborn’s Environmental Interpretive Center) for a look at the antics and problem-solving abilities of these intriguing Michigan residents. Meet the illustrators of Portraits of Poe, enjoy light refreshments and free signed copies of the book while supplies last. Registration is required. To register, call (313) 943-2330 or click the link below. Discuss Poe’s “Annabel Lee” in English and Arabic with librarian Patty Podzikowski. Pick up a free copy of the book at any Dearborn Public Library. This work is in the public domain and can found here. Visit Bigreaddearborn.org for more information and a full list of Big Read events or click here for a PDF calendar of events.